Mikko Laajola & Niko Punin from Windowfarms Finland presented in Riga during Baltaa Nakts (White Night) this recent weekend. They presented and shared the first edited video documentations of the earlier growing and installation process at Kiasma. These will be released shortly on Pixelache Vimeo site, with accompanying music by Dreadlock Tales. 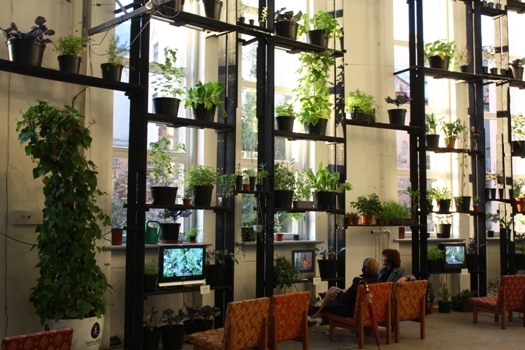 They were invited by RIXC and New Theatre Institute of Latvia to present within the context of their Garaa Pupa project, which creates a social art campaign inviting residents of the city to share their urban gardening, by presenting their edible plants in a temporary collective windowfarm in RIXC Media Space. Read more here in Latvian and summary in English. Other Herbologies/Foraging Networks collaborators, SERDE also had activity during White Night 2010, sharing recent expedition learnings about herbal remedies from Kurzeme in their presentation Tautas Aptieka (Folk Pharmacy).